En español | Trends, shmends. Why care? Because staying current — beauty- and fashion-wise — keeps us looking contemporary, just like knowing what’s new in food, fitness, politics, art, film, books and technology keeps our thinking current. Adding one trendy fashion item can inject the most basic wardrobe with attitude. Runway looks are extreme and basically for show, but they do trickle down to wearable, affordable versions that sell at a mass retail and fast fashion level. Some merit our money, while others don’t. Filter my list of this spring and summer's greatest hits (and misses) to find your match. 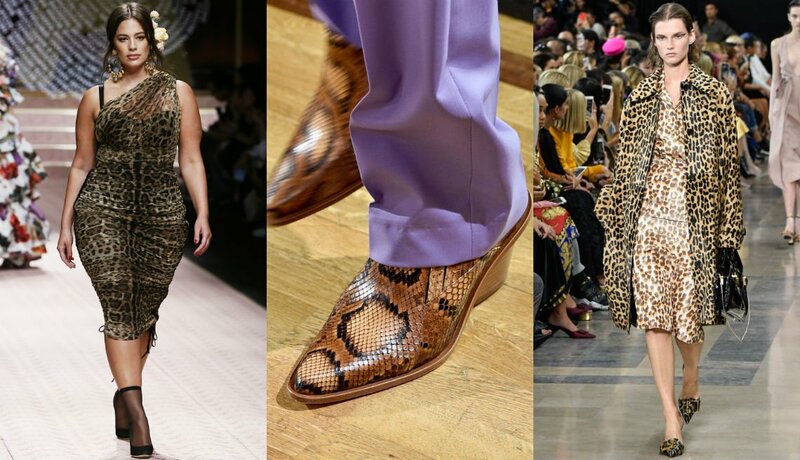 Dolce & Gabbana leopard-print dress; Paul & Joe snakeskin ankle boots with lavender pants; Rochas leopard-print dress and coat. Leopard and cheetah are still wildly chic. We’ve been loving, buying and wearing them since the ’60s, so why stop now? Grab the blouses, midi skirts and dresses that are so “trendy.” Snakeskin has slithered in, too, but this trend comes and goes, and either you like it or loathe it. My pro tip: Stick to classic animal prints — such as leopard and cheetah for clothing (zebra is an outlier here) and let reptile-embossed sandals or booties add a hiss of style to jeans and pants. 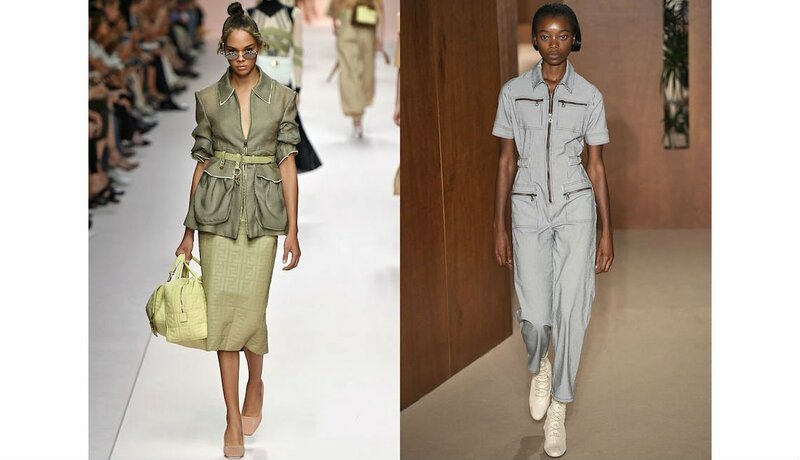 Fendi cargo jacket with patch pockets over a sleek pencil skirt; Alexa Chung gray utility jumpsuit. This trend looks rad on the runway, rational in real life. Jumpsuits resembling vintage mechanic/pilot ones, cargo pants and surplus jackets have been updated. Choose relaxed, slouchier pieces with some waist definition (elastic insets, a belt or nipped in shape) in soft, stretch blends. Those extra pockets are great for stashing keys, iPhone, I.D., glasses and lipstick. My pro tip: If you like boyfriend jeans, you’ll love the cargos — but look for ankle cropped ones. You won’t see many cargos on runways but they are a runaway trend at retail. Dress up utility pieces for work and evenings — throw the jacket over tailored skirts and feminine dresses, add a silk blouse to cargos, and wear the jumpsuit with kitten heels and a blazer. 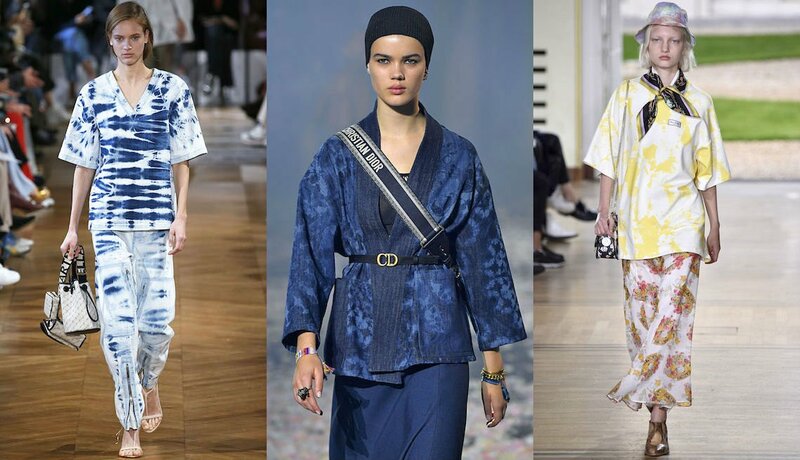 Stella McCartney blue-and-white tie-dye top and pants; Dior tie-dye blue kimono jacket over blue midi skirt; Paul & Joe tie-dye skirt and top. Hippie splatters are reinvented in neutrals with controlled coloring. And this is not just a one-season fad: This trend is continuing on into next fall and winter, thanks to fashion’s weird one-season ahead show calendar. I’ve just seen it! My pro tip: Opt for muted black or gray and white tie-dye instead of splashy kaleidoscope colorings you see on runways, or choose a dip-dye effect that’s more ombré and monochromatic for a more versatile and sophisticated look. Midi skirts, sweatshirts, blouses and "athleisure" pieces make the most sense. Miu Miu denim midi skirt Spring 2019 Eva Mendes for New York & Company; denim trumpet skirt and cropped jacket; Tommy Hilfiger denim midi with platform sandals and print blouse. If you love jeans or love the idea of jeans, but you haven’t worn them in years, this is how to do denim now. Structured midi and pencil skirts were not newsmakers on runways, but they sure resonated with stores and online retailers who know a lifestyle hit when they see one. 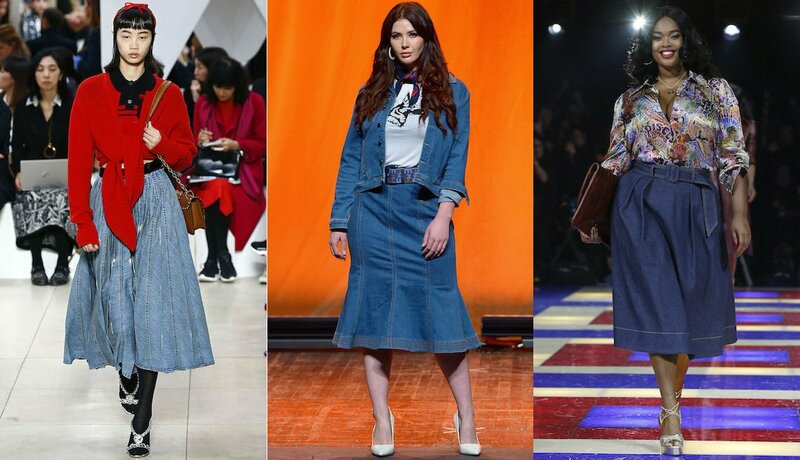 My pro tip: Stick to well-cut knee-ish-length pencil skirts or midis that resemble regular clothes (minus the jeans-look pockets and stitching) and shirt dresses that are really dresses (not just extended chambray shirts with curved tails), and those with a bib overall top. Kate Spade yellow midi dress; Andrew Gn butter-yellow soft shift dress with flutter elbow sleeves; Carolina Herrera yellow skirt with white blouse. The big color trend is upbeat yellow in all its varied pale, rich and spicy variations. It’s not just school-bus bright, but there's also banana and butter, marigold, turmeric, honey and saffron yellows. Yellow works equally well with white, cool tones like black or navy, and warm tones like tan or brown. My pro tip: If you’re an I-can’t-wear-yellow resister, try it in a print, a skirt, shoes or a bag. 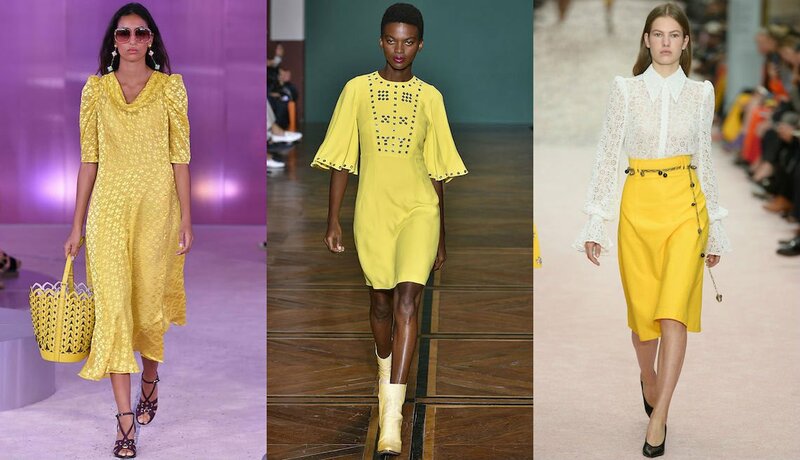 Skip sharp acid or neon yellows, like lemon or chartreuse, which are harsh on some skin tones, and opt for clear, sunny bright or softer mellow yellows like banana, amber or butterscotch (yes, those are yellows, too!). Alexa Chung white double-breasted pantsuit with white button down; Tibi pinstripe pantsuit; APC tailored denim pantsuit with belted jacket and slim ankle pants. Stop stalling. This duo never fails to make us look confident and crisp, even on the hottest, humid or rainy days. When your hair is misbehaving, your makeup feels tacky and you feel sweaty and bloated, the sharp firm shape of a pantsuit will get you through. The new factor is in the proportions — the jacket is trending more relaxed and longer than in recent years, with a slightly oversized feel but no crazy-wide shoulders! My pro tip: Choose a high-rise pant that sits at your waist (your preference: cropped, slouchy long, slim or loose) and works with your shoes, and style with a longer jacket in single-breasted or the new double-breasted versions. 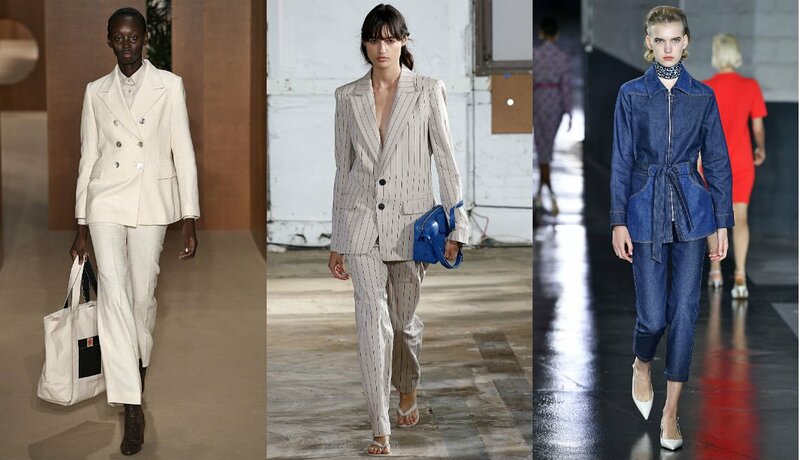 Look for a pantsuit in light-reflecting white and in colors such as beige, tan or pastels, or a comfy lightweight denim. 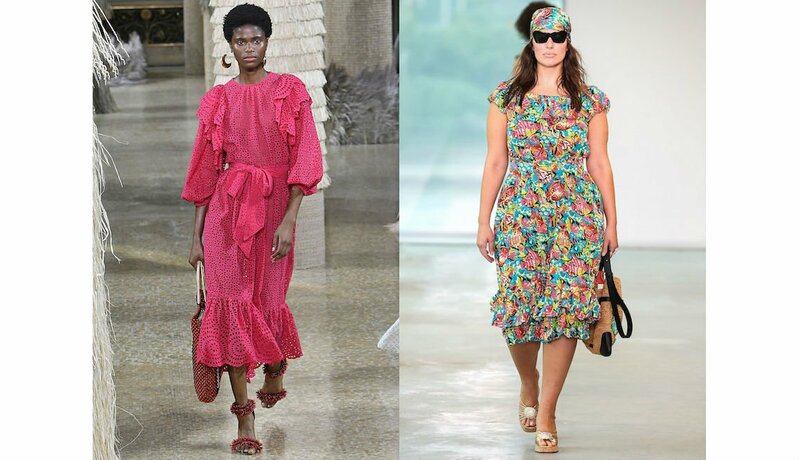 Ulla Johnson bright-pink ruffled midi dress; Michael Kors floral midi dress. 7. Happy “pretty” midi dresses. Breezy and bright, ruffled or wrapped midis in summery candy colors and prints (especially florals) are a feel-good item to throw on anytime. These mood shifters and body boosters are an extended 12-weeklong “spring break” on a hanger. And before you ask, they work with any shoe anytime. Studded belt on green sequin dress by Saint Laurent; Ferragamo narrow belt on tan pants; rope and beads belt by Philosophy Di Lorenzo Serafini; Balmain baby-blue leather and chain-link belt on high-waist jeans. 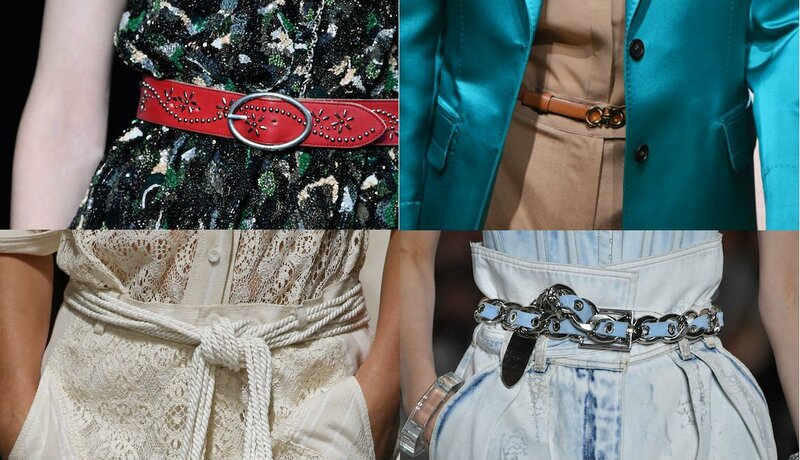 We need belts to cinch our new summery high-waist pants, jeans and skirts, as well as to add definition to loose dresses, blazers and tunics on occasion. A belt makes us shapely regardless of our weight, size and body proportions. Look for new twists of chains and leather and standout colors to create contrast, metallic gold or silver for instant dress up, wide soft leather and suede obi- style sashes. My pro tip: Belly bulge? Choose a skinny belt rather than a wide one, or use a soft, long scarf as a sash belt, even with jeans. Tie a big soft bow, and let the ends drift over your tum for camouflage and style. And this trend is easy to find at consignment shops and flea markets now. Prada white kitten slingback; Hermes white wide-strap flat sandals with closed heel and peep toes; Paul & Joe white kitten-heel ankle booties. If you ignored the white bootie trend this winter (like I did), there’s a summer trend that’ll make up for that style lapse. White shoes are the new basic goes-with-anything bottom line. 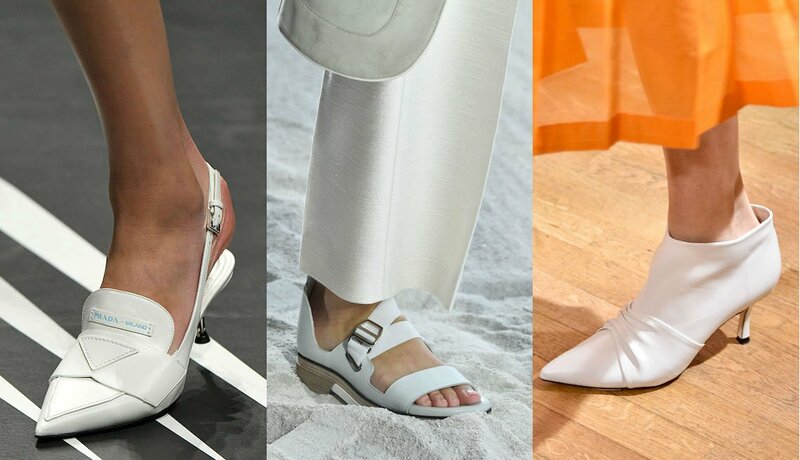 Choose from elegant kitten-heel slingbacks, glam comfort sandals with wide straps, mules and those still “in” white booties that are sort of rock-star cool. The offerings are endless — all you need to decide is whether to go peep-toe or closed. Eva Mendes for New York &Company's vertical striped high waist pants; Chocheng striped pastel shift with sleeves; A.W.A.K.E. striped wrap skirt with white shirt. A few years ago, we adopted striped boatneck sailor tees with three-quarter sleeves as our favorite top. We couldn’t buy enough and still can’t. 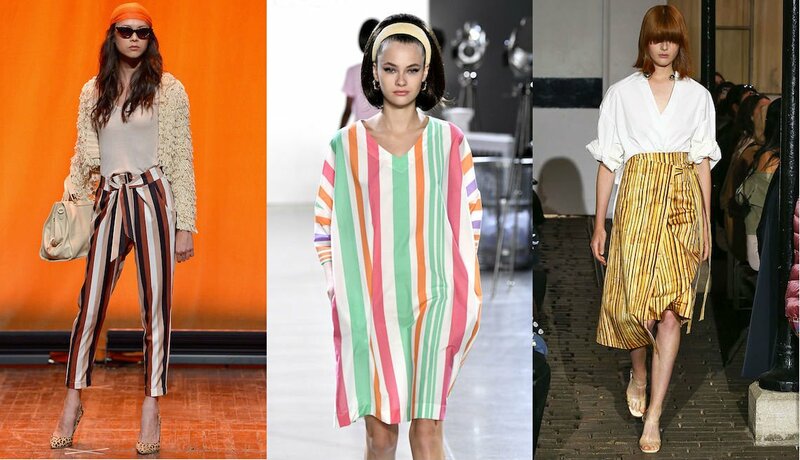 It worked so well that designers have now striped up everything in sight for spring — dresses, pants, jackets — in a rainbow of colors. Be selective because unlike our basic nautical tees, this is likely to be a one-season affair. My pro tip: Decide what you want these bigger and bolder stripes to do — those that run vertically up and down will slim and elongate, while horizontal stripes emphasize curves. For more beauty and style tips for women age 50-plus, check out The Woman's Wakeup: How to Shake Up Your Looks, Life, and Love After 50 by Lois Joy Johnson.